Monday Morning Magic (The Gathering): Playing in the "MUD"
When you play standard at a more competitive level, there will always be decks that are at the top. 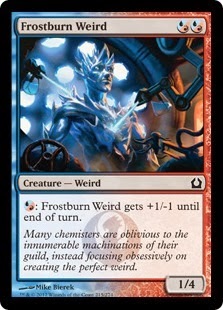 Luckily, during this season, we are blessed with a diverse ecosystem of, top tier challengers from "tap Nykthos, Shrine to Nyx 4 times and get 50 mana that I will then pump into Polukranos, World Eater," to "play a bunch of black stuff while killing all of your creatures until I get a full charging Desecration Demon or cast Gray Merchant of Asphodel for lethal." 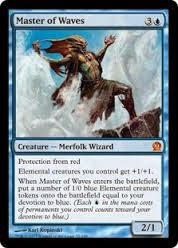 Possibilities in Standard are abundant, but today I want to talk about one deck: Mono-Blue Devotion (or as I like to playfully call it, "MUD"), and how to build it in it’s most basic form. It is not exactly the most complicated shell for a deck, though it does call for many deck building decisions based on preferences and your local meta. The Shell is simple, just a critical mass of Blue creatures. The cards listed above are those that are widely accepted as cards you must play in the generic Mono-Blue, (you will find out that I do not follow this exactly) though there are still 28 slots still open in the deck. 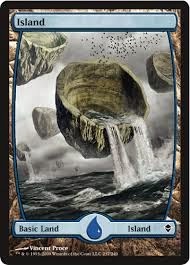 Unless you are playing Legacy or Vintage, your deck must have lands. 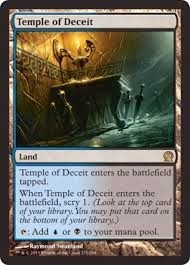 For MUD, you think it would simply be play all the Islands you need but due to a little card called Nightveil Specter, you should consider playing dual lands such as Temple of Deceit or Temple of Enlightenment. 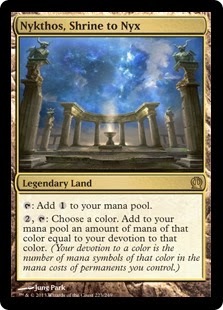 How you run your lands is up to your personal meta which is based on if you are playing at your local FNM or going to a GP (though if you are going to be competitive it is widely accepted that you use four Temple of Deceit). Before you get to how many Islands you need to run, you need to figure out how many Nykthos, Shrine to Nyx you will run. Many decks will just run one though it could just be up to you (I prefer to run two so that I can draw them). Now all you have to do is make sure you have 25 land. Lets say you run 4 Temple of Deceits, 1 Nykthos, and 16 Islands, now you have the seven slots left and this is where you will get most variation in MUD. 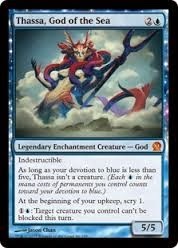 You have plenty of choices for you last seven slots, you could run Jace, Architect of Thought, Bident of Thasa, Rapid Hybridization, Cyclonic Rift, Domestication, Dissolve, Omenspeaker or my own special thought: Fated Intervention. This part is almost all up to you, but I personally love the idea of playing 2 Bidents, 2 Cyclonic Rifts, 2 Rapid Hybridization, and 1 Jace, Architect of Thought. Good luck, thank you, and don’t forget to brew.